Growing up in a small remote part of Northern Australia meant our only real form of entertainment was traveling and camping. My parents have always been huge camping fanatics. Out in the middle of nowhere with only a campfire and a good book to keep us occupied. Being a parent myself now I continue to share my love of camping with my wife and children. But with more modern luxuries, to make the outdoors more comfortable. The only issue is they all want to be connected to the outside world, not only with nature. So it became obvious we had to start to find a way to keep all of their smartphones, tablets, laptops, and radios powered up throughout the week. So the task was on to find the best portable battery pack with an ac outlet. There were a few important conditions, the AC outlet power bank had to be able to be charged from a small portable solar panel. Also, it has to be under 100 watts of the total power so it could be taken on airplanes. FAA rules state that all battery banks need to be under 100 watts of power. Recommended for Extreme tech users that need fine voltage control and need wireless charging. Suitable for Air travelers, campers, remote power users, hikers, students, doomsday preppers, and anyone that wants to charge their power bank anywhere at any time with anything. Eg Solar, USB or even another power bank. Air travelers, campers, hikers, students, security guards, remote users, office workers, end of world preppers, charge quad-copters, and drones. But this power pack can only be charged by the supplied wall quick charger. Users that like value for money. So after checking out all the online reviews and reading countless reports on power management, I decided on two portable power packs with AC Outlets. They are the Omnicharge 20 and the Ravpower 27000mAh. Both of these power banks suited our family needs and then some. So let’s go into our 6-month usage and check out the pros and cons of each. Why are they so different? Portable Power Pack with AC Outlet, OmniCharge Review. The Omnicharge is the bee’s knees of AC portable power banks. 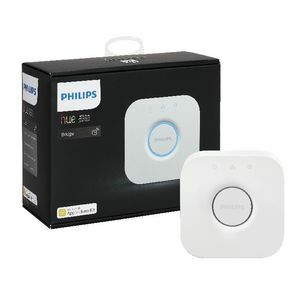 Its feature rich with a price tag to match, but you feel like you are actually getting value for money. Its low profile compact design is perfect for the mobile traveler. Hiking, camping, office worker, student, workshop engineer, portable power supply for electronics or frequent air traveler, you will have correct power ready to go. I already own the fantastic Ravpower AC power bank but I needed another one that could also do a variable DC output. This is when I discovered the very new Omni20 and its smaller brother the Omni13 Ac power bank. The great thing about the Omnicharge 13 & 20 is they both come with an LCD display that will tell you everything you need to know about the health and power outputs of your AC power bank. Power remaining in time as well as percentages. Turn on off functions like wireless charging. The settings can be accessed by pressing the 3 buttons on the front of the power bank. With common presets available on the 1st LCD display menu screen. 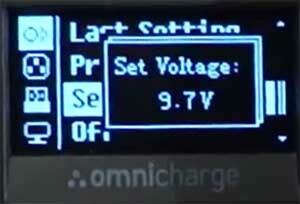 The most common output voltages are quickly selectable for your device. Once you have selected an output voltage you will be shown a warning confirmation screen. This is so you don’t damage your device by outputting the incorrect voltage. You can also set incremental voltages in 0.1v steps. This is great for very fine control for driving exact volts for an electrical experiment in your lab. The main reason I purchased the Omnicharge 20 was that its one of the first portable power pack with AC outlet that can actually be charged from any power source. A fast wall charger is included but I love having the option to charge from any other power source from 4.5v up to 36 volts. AC or DC now that’s amazing. This means you can use a foldable solar charger, a laptop USB port from a computer, other computer or display monitor power source, a car pocket size jump starter and even another power bank. Your recharge options are virtually unlimited. That’s the main selling point and the reason it’s slightly more expensive than the competition. USB output up to 3A per port. One port is QC3 fast charge compatible. 120v AC output limited to 100 watts maximum. Variable DC output selectable from 1v to 24v in 0.1v increments. So if you have a few different voltage laptops you can charge them all with the selectable voltage control. Perfect for the garage hobbyist requiring different DC output voltages. It’s all well and good to have different input and output charging options but what happens if something goes wrong or there is a wiring issue. This powerful intelligent charging protection system not only makes the charging process easy but also it also protects and extends the battery life of your Omnicharge power bank. Each internal battery is a pack of 18650 Li-ion cells. Together they make 6 cells, with 73Wh 20400mAh at 3.6V. Each internal battery is a pack of 18650 Li-ion cells. Together they make 6 cells, with 73Wh 20400mAh at 3.6V, full charge control of your device and internal batteries is paramount to a safe and long device life. Can I take the OmniCharge 20 and Ravpower 27000mAh on an Airplane? Sure the great thing about these little power banks is that they are FAA approved. Because it’s under the 100w internal battery limit you will have no issues with it. Whats great is if you are on a long-haul flight, you can deplete your laptop battery and then fully charge it again. All the battery powered electrical outlets can be used at the same time. So if you are flying with your family just put this power bank in the middle and run leads to each person device. Totally legal, totally fine. Both Omni 13, Omni 20 and RavPower 27000 can be packed with you in your carry-on luggage. 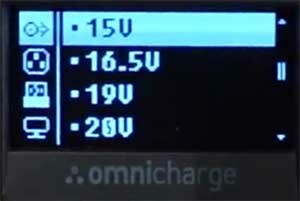 The capacity of Omnicharge 13600mAh is 49Wh. 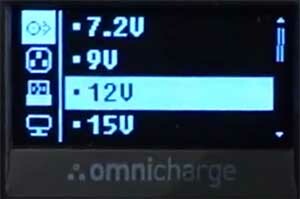 The Omnicharge 20400mAh has a 73Wh internal battery. The Ravpower AC power bank is around 99w. They all fall within the Federal Aviation Administration’s safety limit of 100Wh maximum capacity. Click here for more detailed information on FAA air travel rules for power banks. Can we charge a laptop with a power bank? Some power banks also output a DC voltage like 19 or 20V. These can sometimes charge a laptop depending on current limits. The safest and easiest way is through an AC outlet battery power bank. How to charge a laptop with a USB power pack? 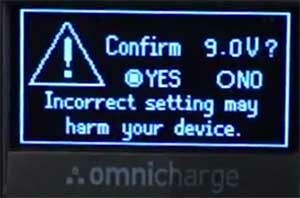 If you are using the OmniCharge make sure to first plug in your laptop charger to the power bank. Then you should choose the output mode from the menu: Normally 120V AC mode or 150V HVDC mode. Press the AC/HVDC button to activate the output function. a) 120V AC mode: AC with a zigzag line beneath. It supports most of your devices just like your home wall outlet. b) 150V HVDC: Shows DC with a straight line beneath. Its only supported by certain devices such as switch-mode power supplies. (SMPS, most modern AC/DC power adaptors are switch-mode power supplies such as Apple’s iPhone/iPad chargers and MacBook Air/Pro power adaptors). If you don’t know just select 120v AC mode. The Omnicharge is also a wireless charging power bank. A great feature is you can also see the power draw while your phone is magically charging through the air. Not all phones support wireless charging. Check your manufacturer if your phone is supported. Find the optimal Qi wireless charging position, which is on top of the Omnicharge and at the back. You will know when you have found the optimal Qi wireless position. That’s when the output power on the display reaches 7 to 8 Watts. Please move your phone around slightly if the power reaches 4 watts or less. 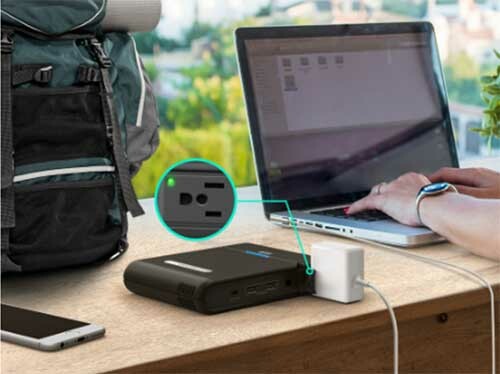 At first glance, this portable power pack with an AC Outlet has no LCD display. There are also no settings to adjust. All we have are 2 different outputs and some blinking blue LEDs. Do to owning the advanced OmniCharge-20 I decided to give the Ravpower AC battery charger to my oldest teenager for school and work to use. Even though we live in Australia where the voltage is 240v you will be surprised how many of your smaller electrical devices are compatible for 110v to 230v. Type B plug, US to, Japan, Canada, Australia Grounded 3-Prong plug. Mostly this AC power bank gets used for cellphone and tablet charging. My wife occasionally takes it out with her if she has a photo shoot in a remote location. That way she can keep all her camera batteries and remote Protog trigger lamps batteries charged up if the photo shoot goes longer than anticipated. Saves on having to buy extra batteries for each device. She also uses it to recharge her battery operated heated jacket. This way she can turn the heat up high and just recharge the spare battery on location. Overall I have found the Ravpower AC power bank to be a very cool little AC power backup device. The big draw card to this power bank is its low cost. Compared to the OmniCharge 20 its nearly half the price. You do lose some features though for the discount. No DC output to charge a laptop. You have to use the AC output and your laptop charger. Need to use the fast wall charger. You cant charge it with a solar panel or another power bank. when no connection is made after powered on for 1 minute. • Press the Power Button once to check the remaining battery level. • Use a 19V/1.6A (max) adapter to charge the portable power outlet. button again to show the remaining battery level. • If the AC output fails, press the Power Button for 3 seconds to turn on the AC output again. The RAVPower 27000mAh Portable Charger with Built-In AC Outlet pdf user manual can be downloaded from here. All these Ac power banks are so different to each other its hard to pick a winner. It’s going to be up to the end user to determine what you really need out of your portable ac power bank. I ended up just loving my Omnicharge 20 so many outputs and charging options. 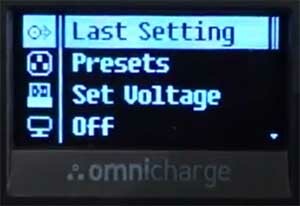 What I liked about the Omnicharge 20 was its ability to be recharged from any power source. Be it solar, another power bank, a wall power charger, another computer or any voltage from 4.5 volts all the way up to 36 volts. This is a game changer. No longer am I looking for the correct wall charger just grab anything lying around and plug it in with the supplied end tip changing plugs. I also liked that the output was able to be changed from 1 volt all the way up to 24v. It’s like having a variable DC power source on your workbench for all those special projects. What I liked about the Ravpower 27000 mAh AC power bank was its low price. Students will find this a huge win. If all you need is DC USB power and AC power out then this is the boost pack for you. 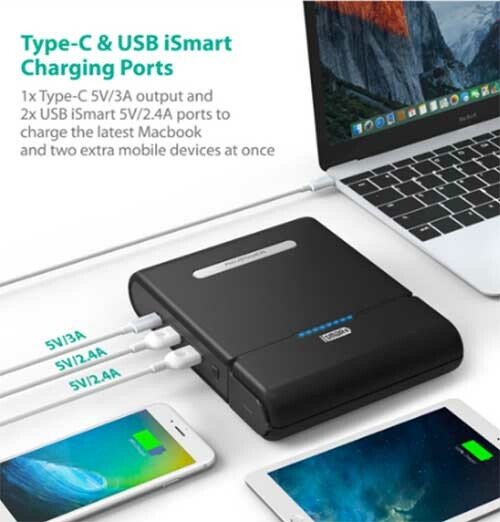 Its also right on the edge of the biggest power bank that you can take on an airplane. This will give most laptops a full charge so you can finish that report or movie while traveling on those long flights. It’s hard to review both these great Air travel approved power banks without talking about the Chargetech. It was one of the first the AC outlets you can take on the go and is approved for air travel. It can power small devices such as laptops, lights, digital cameras and medical devices like a CPAP machine. With a 27,000mAh capacity, the possibilities are endless. As featured on Wirecutter and NBC News, it was voted the best battery pack of 2017. Now available in Europlug Type C format. Model: PPO. With the competition now getting more crowded, it’s great to see better features and prices. The Chargetech portable power outlet is starting to lose its crown, but I’m sure it won’t be long before we see them out with a newer better feature-rich model. When I was doing my research in OmniCharger vs ChargeTech, my money was better spent buying a power bank that could output an exact DC voltage. I also needed it to be able to be charged from a cheap foldable solar panel. So the Omnicharge won out in the end. The end result was the OmniCharge for features, but RavPower for the best price. You said an important selection criteria for you was the ability to recharge the battery bank from a small solar panel and narrowed your choices to the two items reviewed. However in your comments for the Rav product you state the inability to charge the Rav as a con. Can you clarify if the Rav can or cannot be charged from a solar panel such as one from Rav? 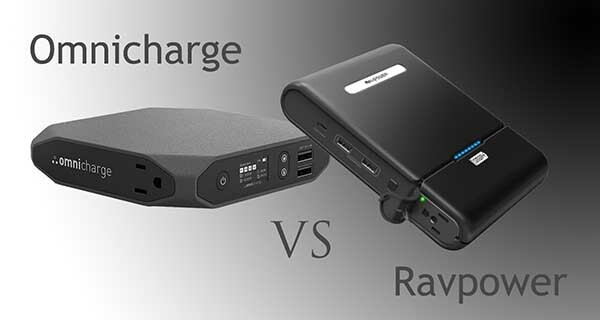 The RavPower 27000 can only be charged from the supplied wall charger this is because if the 19v required to charge it. Its the one big reason I love the Omnichrge due to the many options to recharge the portable power pack. Hope this helps. Portable solar panels especially the smaller ones are most suited for mobile phone charging but will charge the Omnicharge slowly.